RAILROAD.NET • View topic - Proposed line in Bergen County? Re: Proposed line in Bergen County? Just a wild guess, but could the map you're describing show the PS interurban line that roughly followed the routing you describe? I believe a good part of this is still a PSE&G right of way. Was conceptually a continuation of the Graham Line east; never built. The Machine wrote: So I actually found a map that shows the line I was talking about. This 1872 map shows a "Proposed Rochdale Branch" of the New Jersey Midland railroad (forerunner of NYS&W) that would go through what is now Fair Lawn then along the Saddle River to the NY border. There was no Erie Bergen County branch yet, I'm assuming this would have supplanted that. Just another interesting FYI, it also shows the never completed line under Frist Mountain and through Verona. The proposed line going north/south between the PVL and Northern Branch is todays CSX Riverline what would've been back then the New York, Westshore and Buffalo. Steve F45 wrote: The proposed line going north/south between the PVL and Northern Branch is todays CSX Riverline what would've been back then the New York, Westshore and Buffalo. The route of the 1872 proposed Midland RR Extension and the later West Shore sure are similar. I'll have to dig to see if they are related in some way or if it is just coincidence. The line first opened in 1872 as a spur of the New Jersey Midland Railway, which had built the section south of Ridgefield Park. 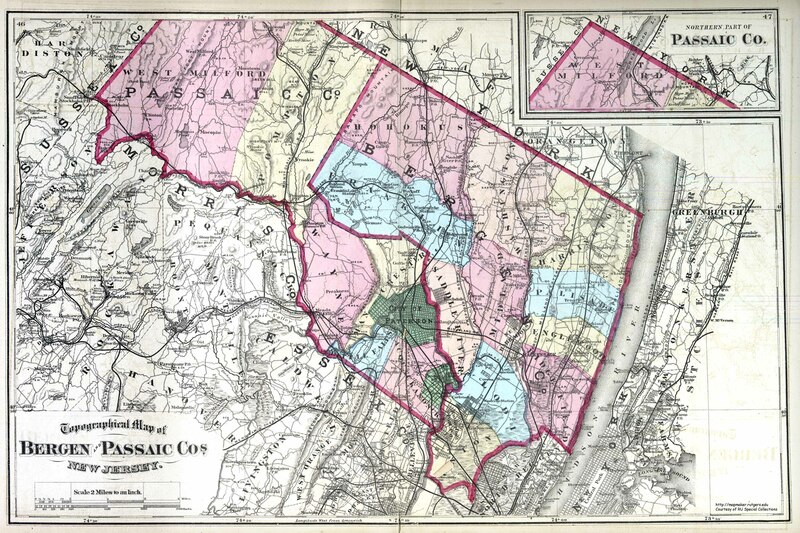 At that time, the northern terminus was at Tappan; . 1872 opening is the year of the map posted above. So it indeed sounds like the the line started operating as an extension of the NJ Midland (later NYS&W), hence the name on the map, because the section south of Ridgefield Park did not come until 1883 (date according to the Wikipedia article).